Fabulous home located in one of the most sought after areas in PV! This meticulously maintained home sits on a private acreage with mountain views and numerous stately palm trees in front and back. Serene moments are yours with the front bubbling water fountain. The elegant circular drive with portico will surely impress your guest. Dramatic sparkling blue pool with palms will greet you through the wall of windows in the grand living room as you enter. This spacious living room also boast a high 2-story vaulted wood beamed ceiling and wet bar for entertaining. Enjoy the flexible floor plan of this home that you can customize to meet your family needs. This lovely home features a pool house with bath that could be used as a bedroom, office or exercise room. The large carriage house…. Directions: From Invergordon go West on Doubletree Ranch Rd, South (left) on Via Los Caballos, South on 58th Pl. Home is on the Right. Approximate size: 49692.00 sq. ft. Please, send me more information on this property: MLS# 5853573 – $2,200,000 – 8700 N 58th Place, Paradise Valley, AZ 85253. 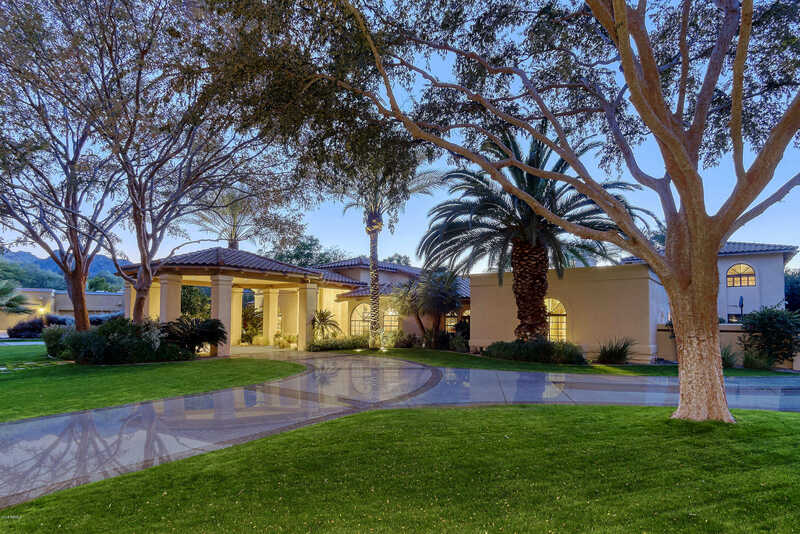 I would like to schedule a private showing for this property: MLS# 5853573 – $2,200,000 – 8700 N 58th Place, Paradise Valley, AZ 85253.